Over the last 7 days, the Greater New York Red Cross provided emergency assistance to 80 adults and 42 children following 40 local disasters. Here are some highlights from last week and a preview of upcoming activities (see below). The Greater New York Red Cross had a busy weekend. On Sunday, Red Cross volunteers and staff served as medical spotters for the NYRR Bronx 10-Mile Marathon. Red Cross volunteers also attended the Northport VA “stand down” and provided service members comfort kits, smiles and thanks for their sacrifices for our country. On Saturday, the Red Cross assisted 14 adults and 13 children who had to leave their homes in Queens by setting up a shelter at our regional headquarters. On the same day, the Long Island Red Cross also participated in the Family Safety and Health Fair at the Brentwood Public Library. Also on Saturday the Metro New York North Chapter partnered with Peekskill OEM to canvas at-risk homes in the community. On Friday, we posted a web article about how Greater New York Red Crossers have been helping and impacting the global community. 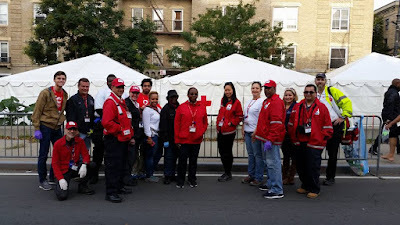 For the historic Papal visit Red Cross volunteers remained on standby ready to provide support to the city as needed. On Thursday, we shared our latest #MyRedCrossLife story featuring Michael DeLeon and his Red Cross experience. On Wednesday, the American Red Cross Service to the Armed Forces program and Verizon Wireless Employees partnered together to help makeover a garden area at the Northport VA Medical Center. Early Tuesday morning, a fire at the Walden Pond Community forced several senior citizens from their homes. The Red Cross was able to provide temporary housing and financial assistance to those who needed it. Our proud CEO Josh Lockwood gave thanks to Wells Fargo for supporting our life-saving mission. On Monday, Red Cross Volunteer Services held a fun bowling social event for volunteers. Sept 30 to Oct 1: Disaster Cycle Services will be holding their quarterly All-Hands Meetings for three consecutive nights at Goshen, Brooklyn and New Hyde Park. Sept 30, Oct 2: Red Cross blood drives; 1 to 7pm; 520 West 49th Street, Manhattan. Schedule an appointment to donate today. Oct 3: Please join us for an unforgettable day as our Home Fire Preparedness Campaign travels to Brooklyn to install free smoke alarms and teach fire safety! This is a great way to help your neighbors and to meet other Red Cross volunteers! For Red Cross volunteers, sign up to be an Installer, educators/documenter, driver, or logistics/staffing here. Training will be provided. Oct 4: The Red Cross will be supporting the “A Family Resource Day” (9am-1pm) which is organized by the New York City Council in Far Rockaway to provided free services and resources for immigrant families. Oct 17: On a Saturday, volunteers and staff will gather throughout our region for our Full Scale Exercise – New York Shakes. In this exercise, we’ll confront the impact that this catastrophic event would have throughout our region. Whether you’re taking on a leadership role or exploring something new, this is an incredible opportunity to practice and to learn. Red Cross volunteers can sign up for a role here.